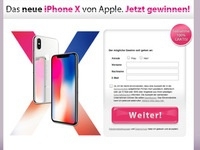 In the iPhone competition, your users can win a brand new Apple iPhone X. The prize is guaranteed and the participation is free for the user. 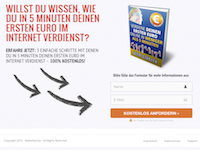 You earn a lead commission of 2.00 Euro for every valid (DOI) registration! Special conditions possible - please contact the operator. In all competitions of the Silver Performance Marketing GmbH (see "SM" in the program name), a global duplicate match takes place. If a competitor has already participated in an "SM" raffle, he is suspended for other "SM" raffles. Restrictions: temporary e-mail addresses, action clicks for sending SMS etc, banner network or banner exchange systems, view bar, cashback, incentive traffic, entry services for competitions etc., internet cafes and other access service providers, domain trading / domain parking and websites without a valid imprint are not allowed ! Not permitted are entry services and automatic entry generation methods. Upon detection, the leads are not evaluated and, if necessary, further steps are taken. Also SPAM mail actions are not allowed.